CAPE TOWN, South Africa -- Nelson Mandela, notable political leader and Nobel Peace Prize winner, was declared dead at approximately 2:40 PM EST by president George Bush. 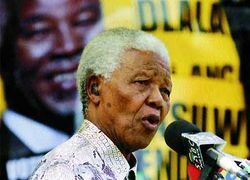 The president implied that deceased Iraqi dictator Saddam Hussein murdered Mandela and his entire family, giving rise to a theory that the Mandelas have been dead for some time now, given the date of Mr. Hussein's death. "We at the Bush Administration have reason to believe that there are ties between Saddam Hussein, the world's most evil dictator and the perpetrator of the 9/11 attacks who will send monster out to eat your children unless you support me, has killed Nelson Muh...Nelson Mann, uh...Nelson Masturb, uh...(twenty second pause)...Mandela. Or is it Mandolin?" When Mandela was informed of Bush's announcement that he had died, he was shocked. "What?" Mandela responded to the news, dropping his ham and cheese sandwich. He dabbed his napkin at the corners of his mouth, did a buggy-eyed double take, and asked the question again. When he was reassured that he was, in fact, very dead, Mandela left his lunch and picked up the phone. He called his sister to deliver the tragic news of their deaths, and was met with even more disbelief. 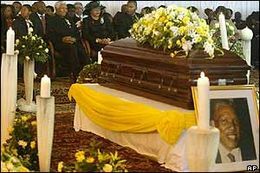 "I could have sworn I was alive," said Mandela's sister before getting into her coffin, "One minute you're getting a manicure, and the next you get a phone call informing you of your own tragic death. Who would have thought?" Mandela then organized his own funeral, and was about to buried when he suddenly made a brilliant observation. "I don't know what Mr. Bush is thinking. I'm not dead... yet," said the apparently good humored former president of South Africa. The crowd returned with laughter, and the gathering dispersed as quickly as it assembled. Bush, however, was not yet convinced. A half hour later, he interrupted a rerun of NUMB3RS to send Mandela his rebuttal: "Don't worry, you'll be stone dead in a moment," the president returned with his trademarked devilish smirk. Mandela, getting incensed at Bush's ignorance, flooded his E-mail box with three YouTube videos. One video pictured the moments of Saddam Hussein being hung; another depicted Mandela telling the camera that he is very clearly alive, almost a year after the first video took place, and the third featured an obese woman getting tazered. Bush's response to the first two videos was simple but clear: "I don't know what else those, uh, African witch doctors in Mandela's side of the world can do, but apparently they're real good at video editing." Shortly after issuing the preceding comment, Bush posted what he claimed were the "original videos" on YouTube as responses to Mandela's two. These videos, a blatant doctoring of the original two so that Sadaam's head was on Mandela's and vice versa, failed to invoke any emotion in Mandela but riotous laughter. Growing scornful of Mandela's insistence that he is, in fact, alive, Bush declared a second funeral for Mandela in front of the Capital Dome, in which he reportedly plans to bury a Nelson Mandela action figure. At this point, the Nobel Peace Prize winner grew tired of the fiasco and delivered his final comment: "You win. I'm dead. Now if you excuse me, I'm going to go finish my goddamned sandwich." Bush will be the main speaker at the funeral, or as he put it, "I'm the eugoogalizer. I do the eugoogalizing. Heh heh heh." Press secretary Tony Snow also lamented that he wished to meet Mandela while he was still alive. "Unlike the issue of wiretapping phone calls, Mandela was one tar baby I always wanted to hug." This page was last edited on 29 October 2018, at 07:31.